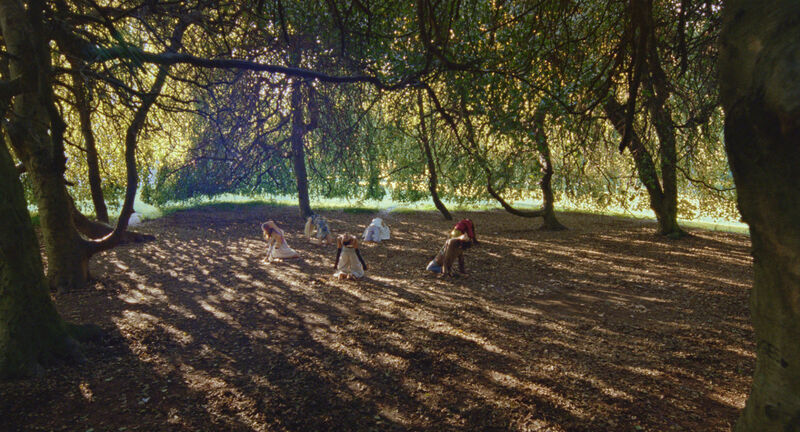 Feeling like a spiritual sibling to last year’s Woods music video from Merlin Camozzi (at least in content if not wider intention), London based Italian Director Elena Petitti di Roreto’s fantastical girly response to desertification and drought Let it Pour for Vogue Italia, observes a magical ritual to call for rain performed by a secret sorority of young women. DN invited Elena to tell us how she came to pair catastrophe on a global scale with an intimate soft-horror story, why we should all be panicking and what’s better than perfection. Let it Pour is a short film commissioned by Vogue Italia in collaboration with Swarovski and produced by Section80. I happen to work a lot with Vogue Italia and when they contacted me for this project it was the second time in six months that Sara Maino, Head of Vogue Talents, had asked me to create a piece somehow related to sustainability and global warming. After Allegory of Water – a lyric representation of the catastrophic state of our oceans – I wanted to move forward and abandon the pure aesthetic for a narrative, quirky and slightly scary approach. I recently came across enlightening New York Times article Time to Panic by David Wallace-Wells. He says: This, to me, is progress. Panic might seem counterproductive, but we’re at a point where alarmism and catastrophic thinking are valuable, for several reasons. I agree. It is time to panic, and nobody really seems to be alarmed. So as a director why not explore the paranoia of global warming and build a soft-horror inspired story where the panic for our planet’s future becomes the trigger, the motivation for an ultimate poetic and witchy sacrifice. I wanted to move forward and abandon the pure aesthetic for a narrative, quirky and slightly scary approach. In two lines this is the story: a sweet pure girl is obsessively watching images of desertification on her cellphone when she gets approached by a group of weird girls. She follows them into the woods and as a result of a rain spell she mysteriously levitates and disappears in the sky. Right after it starts raining. In terms of preproduction, the most challenging part was the casting as I was being quite picky with the girls and we didn’t have infinite funds. We were blessed having Tia Jonsson as the innocent sacrificial lamb, and Deba as her nemesis, the enchanting/evil witches’ leader. We shot one day exterior near Milan. 35mm Film (Kodak Vision3 250D 5207, Kodak Vision3 500T 5219), Zeiss Master Prime Lenses on Arricam LT. The choice of shooting on film was strongly recommended by Cinematographer Mauro Chiarello after few camera tests on location, primarily for the result on the green nuances in the daylight and for the detail we could get in the skin tones. It is time to panic, and nobody really seems to be alarmed. The beginning where the camera is almost static. The walk in the woods alternate to the ritual. Here we shot on Steadicam opposing an internal camera rotation of the circle of girls against an external camera rotation of Tia walking. The sacrifice. This last part we moved to hand-held and kept the style confused and dirty. Postproduction is my real and twisted pleasure. Again we had a very short amount of time for the edit, but I and my one and only Editor Francesco Roma made the best out of it. I understand for some people our editing might feel a bit frantic but what can we do? Deep inside I’m convinced that – quoting Jonas Mekas – We don’t need perfection, we need nervous breakdowns! Let it Pour is one of the many great projects shared with the Directors Notes Programmers through our submissions process. If you’d like to join them submit your film.